I'm going to let all of you in on a little secret: tonight on Victoria (currently airing on PBS here in America), we're finally going to see Queen Victoria wearing a tiara based on one she really owned and wore! Here are all of the details on the real piece it replicates: Queen Adelaide's Diamond Fringe. 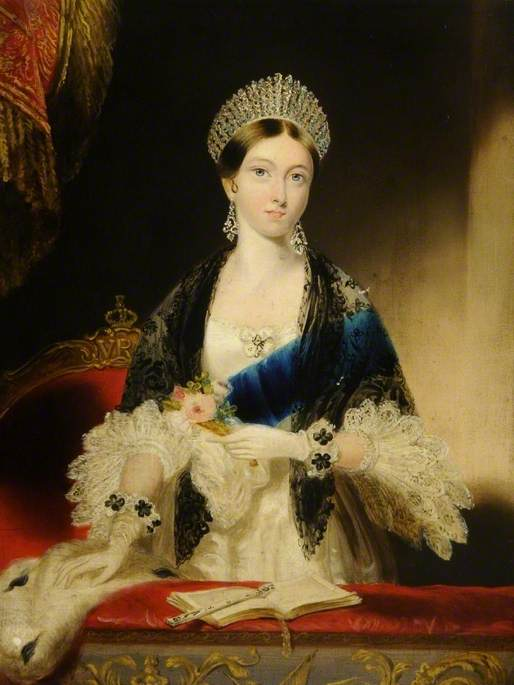 The diamond fringe was one of the first major pieces of jewelry that Victoria wore following her accession. It originally belonged to her aunt, Queen Adelaide, the wife of King William IV. The fringe was commissioned by William IV from Rundell and Bridge in 1831, the year that he and Adelaide were crowned. According to Victoria's 1896 jewel inventory, the diamonds used in the fringe originally belonged to William's father, King George III. The diamonds were apparently taken from pieces of jewelry that had belonged to both George III and his wife, Queen Charlotte. Sir Hugh Roberts describes it as follows: "Sixty brilliant-set graduated bars, the central bars in cushion-cut and pear-shaped stones, divided by 60 graduated brilliant-set spikes; an extra six small graduated bars and five spikes detached; tiara fittings removed." 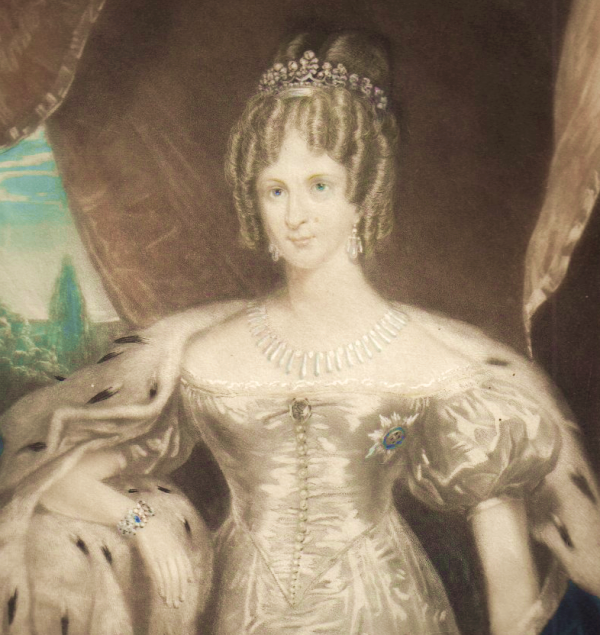 Adelaide wore her diamond fringe as a necklace; you can see it illustrated in a few portraits from the time of her husband's reign. She and William had no surviving children. When he died in 1837, Adelaide handed over the fringe and other pieces of royal jewelry to the new monarch: her niece, Queen Victoria. 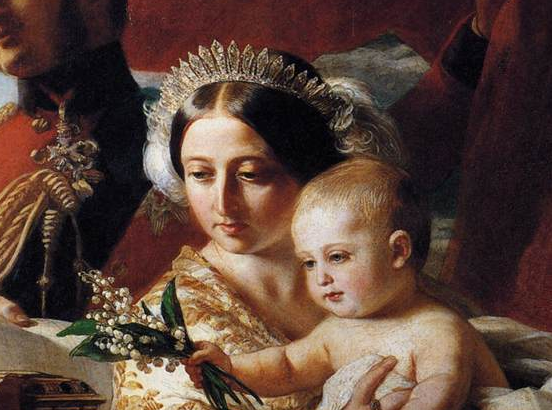 Adelaide and Victoria had a good relationship; Victoria even asked the dowager queen to be one of the godparents of her first child, Princess Vicky. Although the fringe was originally arranged as a necklace, Queen Victoria had it mounted on a tiara frame. 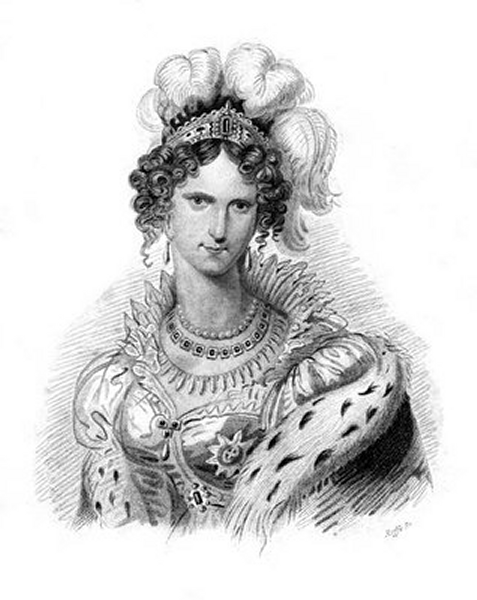 One of her first appearances in the fringe took place in November 1837. She wore the tiara to the theater, an appearance that was commemorated in a contemporary illustration. In this portrait, shown above, the height of the diamond fringe tiara is exaggerated by the artist, Edward Parris. Victoria continued to wear the fringe during the early decades of her reign. 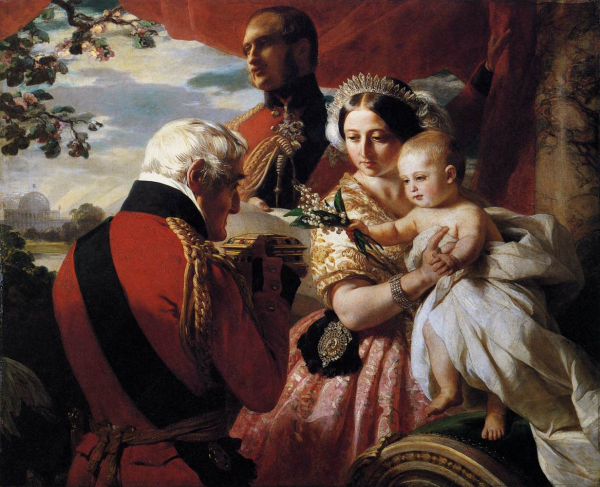 It was immortalized by Winterhalter in The First of May 1851, a painting which features Victoria and Albert with their baby son, Prince Alfred, and his godfather, the Duke of Wellington. Victoria also wore the tiara at one of the seminal moments of her reign: the opening of Prince Albert's Great Exhibition. Luckily, even though it contained diamonds that belonged to King George III and Queen Charlotte, it managed to escape the Hanoverian Claim of 1858. As with many of Victoria's grand jewels, the fringe was largely set aside after Prince Albert's death in 1861, although Roberts argues that she may have worn it as a corsage ornament during her widowhood. (Victoria also apparently noted in her journal that she wore the fringe as a necklace.) The fringe was designated as an heirloom of the crown, so when Victoria died in 1901, it passed to her son, King Edward VII. 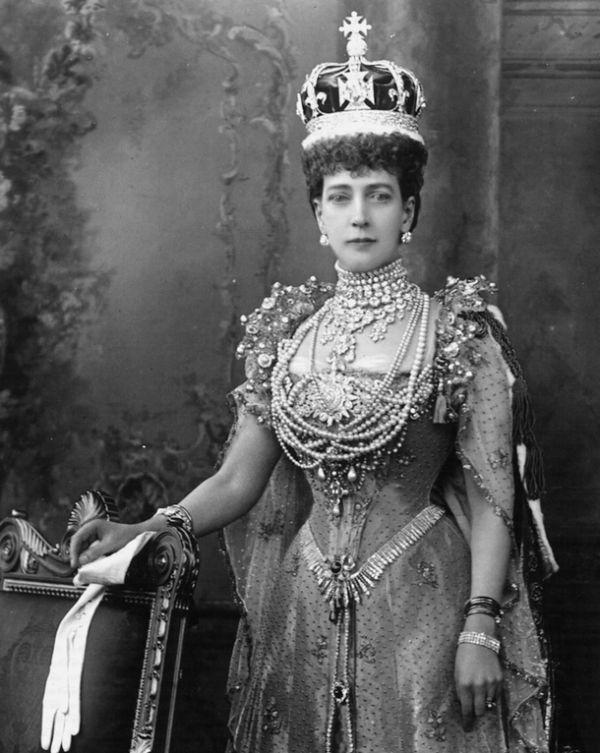 His wife, Queen Alexandra, wore the fringe at the waist of her gown for their coronation in 1902. 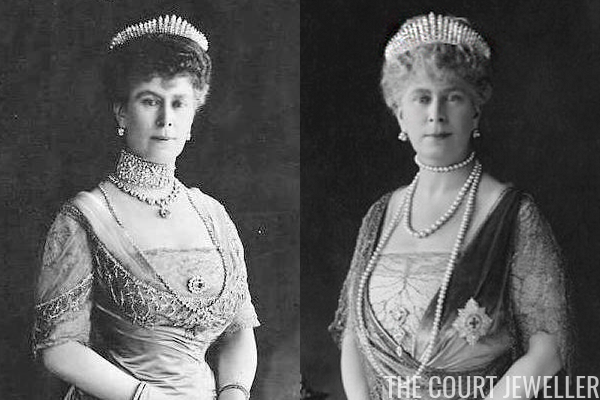 Queen Mary began wearing the fringe after the accession her husband, King George V, in 1910. She had the piece set on a tiara frame once again, and wore the piece this way in several photographic portraits. But Mary was ultimately not satisfied with the fringe as a tiara, and she had her own fringe (Queen Mary's Fringe Tiara) made in 1919. That smaller, more streamlined fringe tiara is the one that was famously worn by Queen Elizabeth II at her wedding in 1947. You can see a side-by-side comparison of the two fringes below. Queen Adelaide's Fringe was taken off its tiara frame once again when King George VI came to the throne in 1936. It was transformed back into a necklace for his wife, Queen Elizabeth, by Garrard, who added a "concealed snap" to the fringe. 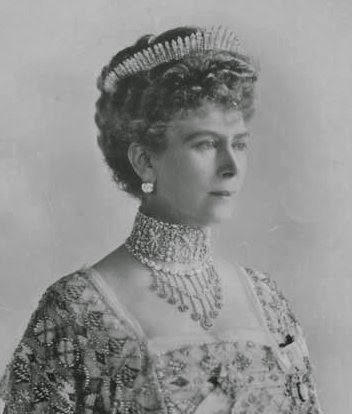 Even after the death of her husband, the Queen Mother kept the diamond fringe necklace in her own jewelry box. The piece should have passed to her daughter, Queen Elizabeth II, as it is one of the heirlooms of the crown. But, along with several other pieces of jewelry, the Queen allowed her mother to retain the fringe. (Elizabeth II had her own diamond fringe necklace already: the City of London Fringe, which she received as a wedding present.) The Queen eventually did gain possession of Queen Adelaide's Fringe; it was transferred to her collection in 2002 after her mother's death. She has yet to wear it in public.